This blog post was written by postgraduate student Yunxuan Qin in the course, Research Methods in Ecology (Ecol608). Yunxuan revisits a Lincoln University research area that looks at how the region of origin affects wine traits from 2013. 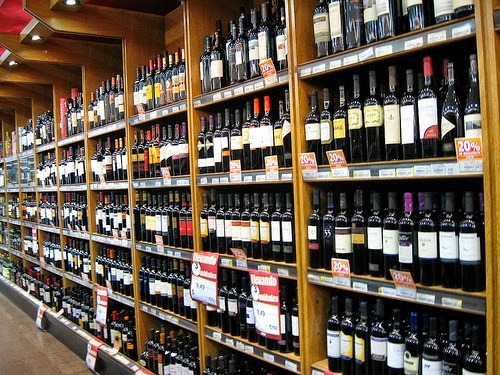 Walking through wine aisles in a supermarket, different brands of wines fill the shelves. Besides all the appealing labels, there must be some inherent differences hidden within the bottles. Unless opened and tasted, the characteristics of the wine remain a secret. However, there is always a clue on the label, indicating where the grapevines were planted and the wine region of origin. Indeed, the expression of regionality is an important part of the philosophy of winemakers in all parts of the world. Wine shelves in a French supermarket. Photo by christine592, CC BY-ND 2.0. That philosophy about regionality is based on a concept, "terroir", which has long been recognized but is difficult to interpret. 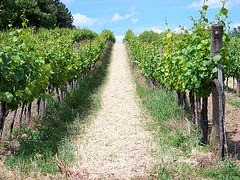 Terroir itself includes many factors, such as climate, soil type, and topography. The common understanding of terroir is "a sense of place" that wines from specific geographic locations can be perceived as different. According to Patrick Iland's, past Senior Lecturer at The University of Adelaide, book The Grapevine: from the science to the practice of growing vines for wine, terroir modifies the flavor shape of wines from different sites within a region, sub-region and even within a vineyard block. 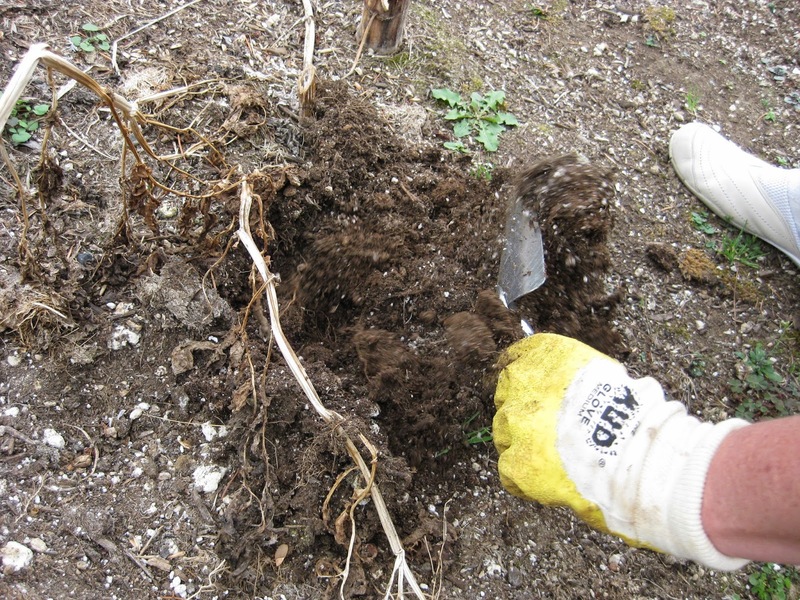 Sometimes, the soil characteristics became the predominant factor impacting on vine growth, berry composition and wine style and quality, as indicated in the figure below. A "vine to wine" web showing vine, berry and wine characteristics from terra rossa and deep black cracking clay soils. Adopted from The Grapevine: from the science to the practice of growing vines for wine, page 287. If we knew the differences in wine characteristics between regions, we could easily make the purchase decision by personal wine tasting preferences, instead of standing in front of wine shelves making a hopeful selection. Another question is how to measure wine characteristics between regions? 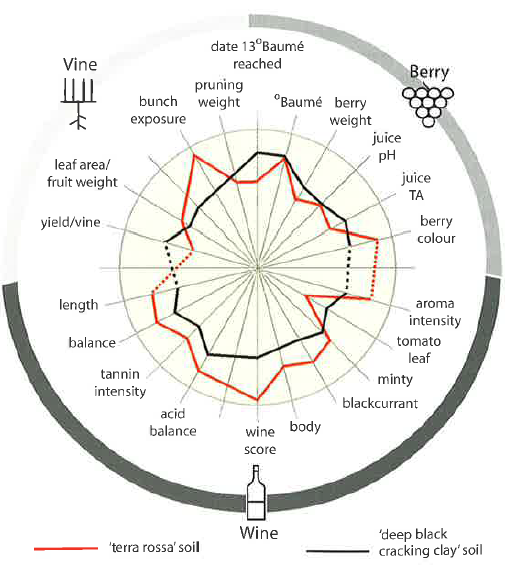 Wine characteristics are measured by sensory attributes, which are difficult to measure. Indeed, everything related to human sensation is hard to interpret. Variables such as personal odor threshold, physiological status (with perceived astringency by saliva as an example), psychological status (with emotional attributes and wine perception as an example) and descriptive vocabulary are examples. Thus, these variables are the reason why human perception of wines will vary from person to person, which makes it difficult and impossible to establish a standardized wine tasting note for every individual wine. A recent study from Elizabeth Tomasino and co-workers aimed at measuring the differences in Pinot noir wine according to their sensory attributes (e.g. aroma, in-mouth flavor, mouthfeel) from four regions in New Zealand. Pinot noir, one of the noblest red grape varieties, is now the most widely planted red grape variety in New Zealand with these wines frequently compared to those from Burgundy. Several degrees of latitude were covered, including Central Otago, Marlborough, Martinborough, and Waipara. These regions were studied as Pinot noir is a locally important wine variety in these places. How did they determine wine characteristics according to different regions? Elizabeth and co-workers did a preliminary tasting by six panelists who afterwards, listed wine aroma and palate descriptors for each of the wines. Combined with previous sensory work, a final list came out, including twenty-five attributes (fifteen for aroma, four for in-mouth flavor, six for mouth-feel). The formal tasting then conducted by asking twenty-one panelists to rank the intensity of each of the twenty-five attribute. As customers, which Pinot noir wine shall we choose from the four regions? According to the results from Elizabeth and co-workers, you can have following options. If you want something red and fruity, you'd better choose Marlborough Pinot noir wine. It was characterized by greater raspberry and red cherry aromas, a red fruit in-mouth flavor, and longer finish length with a more harmonious balance. If you prefer a note of dark fruits and oak, Martinborough Pinot noir wine should be your first choice. Greater black cherry, oak, and spice aromas and oak tannin mouthfeel describe this wine. If you desire a herbal note in your "glass of wine", then the Waipara Pinot noir will be recommended for greater barnyard with violet aromas and a decent in-mouth fruit density/concentration. If you want something neutral, choosing Central Otago Pinot noir wine would be wise. It was the intermediate one and had fuller body. 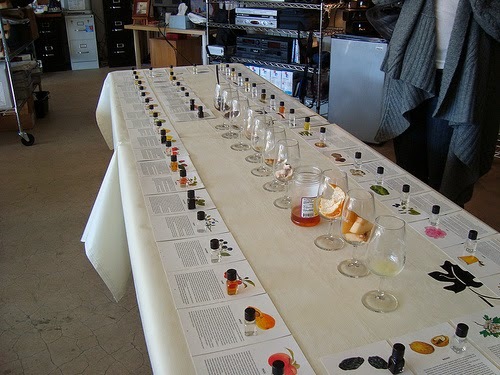 The sensory table, filled with many of the aromas wine may possess. Based on the knowledge of wine characteristics upon corresponding regions and your own preference, followed by checking the region on the label, it won't be hard to make a decision. Indeed, you already establish an expectation before opening the bottle. Another choice is doing a blind selection, and having fun to discovery the secret hidden in the bottle. Nevertheless, nature plays a magical role on wine sensory profiles/styles according to different regions. 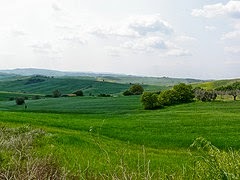 We often address "terroir" to roughly explain the cause, but which factor of the terrior contributes the most to the differentiation remains to be discovered by scientists. Actually, one of my colleague is currently working on it (check the wine research topics in Lincoln University). How reliable is Elizabeth research results? You have to find out by yourself. Enjoy your wine. Cheers! Elizabeth Tomasino, Roland Harrison, Richard Sedcole, and Andy Frost,(2013) Regional differentiation of New Zealand Pinot noir wine by wine professionals using canonical variate analysis. American Journal of Enology and Viticulture.64, 357–363. 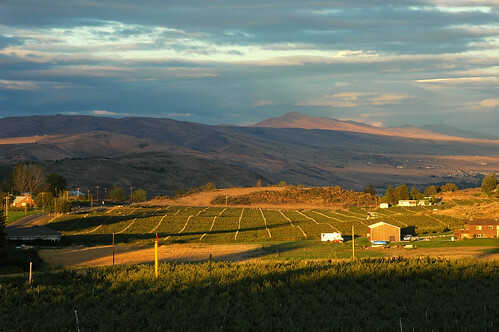 Iland, P. and Promotions, P.I.W., (2011) The grapevine: from the science to the practice of growing vines for wine. Patrick Iland Wine Promotions. This blog post was written by postgraduate student Stefan Unterrader as part of the course, Research Methods in Ecology (Ecol608). Stefan revisits a Lincoln University research area that looks at historical climate data taken from tree rings in 2010. Previously... on the global climate change show - It is well understood that we are facing ongoing warming of our planet's climate. Whether or not we are responsible for this process (and we are), rising temperatures around the globe have been observed for at least the last couple of decades. Although our behaviour is recognized today as a significant influencing factor for Earth's climate, it is not the only driver for today's changing climate. To get a grip on these drivers scientists often use little helpers, such as tree rings, that carry astounding potential for this task. Richard Duncan, a former professor at Lincoln University, and Pavla Fenwick, a former Lincoln PhD student, are among those scientists who are hot on the scent of such internal climate drivers using tree-ring dates from a native New Zealand tree, the pink pine. Their team of dendrochronologists - scientists who date tree-rings - pursue a promising lead which links internal climate variation to regional temperature patterns and try to explain phenomena that do not match the general global warming trend. how to mitigate its consequences. Climate Change in a nutshell: Greenhouse gas concentrations were on the rise throughout the 20th century and global temperature mainly followed this worrying trend. But the devil is in the details: local and even regional temperature patterns around the globe had the cheek to behave differently. And as if this isn't enough, some cooling periods in the northern hemisphere have coincided with some rapid increases of temperature in New Zealand during the same period (for instance, from 1940-1975). So what’s behind all this? Have New Zealanders been polluting the air to such an extent that they generate their own little hot spot? Well, chances are that humankind isn't alone being in the driver's seat to this mess. Back to the Future: In general, global climate is known to be driven by both natural and anthropogenic external forcing as well as by internal dynamics. In order to get a glimpse of Earth's climatic behaviour climatologists can use what are known as climate proxies: preserved physical characteristics of the Earth's past and present climate. Such proxy data allow for a reconstruction of climatic conditions from periods where no instrumental or historical records are available. Tree-rings can be used as such proxies because some trees, such as conifers growing in a temperate climate, will build up one tree-ring each year to grow in both size and rigidity. Based on adequate temperatures and moisture the duration of each growing season will determine the widths of tree rings: high temperatures will generally allow for wider tree-rings, and vice versa. And since many NZ tree species are climatically sensitive enough to temperature for this to be seen in their tree ring widths, we can use their tree-ring sequences as a substitution for instrumental climate records. This is actually quite useful as instrumental coverage here in New Zealand only goes back to about 1850. The hunt for understanding internal climate variability: Because of its isolated location and exposure to considerably high mountain ranges, New Zealand's climate is highly sensitive to variations in atmospheric circulation, the movement of air and thermal energy across the globe. With its native forests that contain many long-lived tree species, NZ is the perfect dendrochronology-lab for investigating changes in such climate circulation patterns. 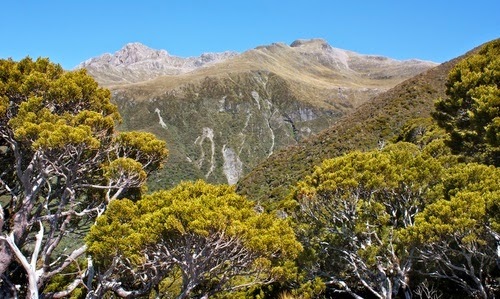 In their 2010 study, Duncan and his colleagues established a tree-ring chronology (a timeline based on a great number of connected, dated tree-ring samples) for Halocarpus biformis, a tree species endemic to NZ and commonly known as pink pine. 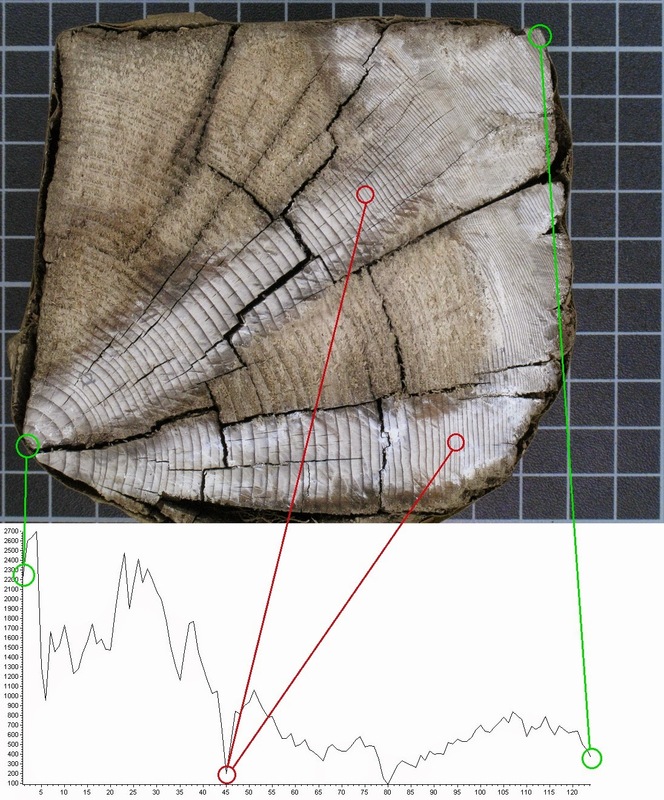 Duncan's team was able to gather samples whose tree-rings were strongly influenced by temperature and significantly corresponded to instrumental temperature data in NZ. Based on this chronology they could reconstruct the mean annual temperature in NZ since the 14th century. Apart from verifying NZ's instrumental records the authors also observed several departures from a global trend of rising temperatures. On top of that, the behaviour of NZ temperatures is not in line with northern hemisphere temperatures. In fact, they appear to be sometimes directly out of phase with those in the northern hemisphere. Who's in charge? Differences in climate patterns between the northern and southern hemispheres have typically been explained by the spatial variation of "radiative forcing": the effects of solar radiation, volcanoes and aerosols on Earth's climate, which all vary both in space and time. In contrast to such a global forcing, scientists identified phases when the southern hemisphere began to warm more rapidly while parts of the northern hemisphere experienced cooling temperatures. Since previous studies already identified regional climate drivers as strongly influencing large-scale temperature variations across the globe, Richard Duncan and his team took a closer look on the main modes of such internal variation: the Interdecal Pacific Oscillation (IPO) and the Atlantic Multidecadal Oscillation (AMO) which can both be derived by measuring the sea surface temperature. New Zealand (Photo kindly provided by Chris Morse). One Pine to rule them all: Through comparing the variations in the Pacific and Atlantic Oscillation patterns with their pink pine tree-ring chronology, Duncan and his colleagues were able to link New Zealand's temperatures to these internal oscillations for the past 550 years. At the same time they identified time intervals where NZ temperatures follow northern hemisphere temperatures and therefore a global warming trend more closely. To make a long story short, these opposing climate states (in-phase or out-of-phase with global warming) recur on a more or less regular basis and can hardly be explained by us polluting the air alone. While our influence on Earth's climate is beyond doubt, this study reinforces previous research where natural climate variation on a more regional scale still plays a powerful role in controlling New Zealand's temperatures! The story of this NZ pink pine chronology not only shows how valuable tree-rings can be for reconstructing past temperatures but also reminds us that the term "global warming" may only tell parts of the story. ...to be continued: The study by Duncan and his colleagues is not the last piece of work in this area. The University of Auckland's dendrochronology-lab, for example, is primarily investigating kauri trees and has built up kauri tree-ring records for the last several thousand years. Tree-ring records stretching over such long time scales have been related to El Niño/Southern Oscillation (ENSO) activity which is another key climate driver for New Zealand and likely to be more dominant in the decades to come. A current overview of what has already been done with tree-rings and other climate proxies on the southern hemisphere was given by Neukom and Gergis shortly after the release of the pink pine study. And there's definitely more to come - I wouldn't wonder if tree rings will stay a key indicator for understanding New Zealand's past and future climate. This blog post was written by postgraduate student Davena Watkin as part of the course, Research Methods in Ecology (Ecol608). Davena revisits a Lincoln University research area that looks at a study of how possums respond to moonlight in 2011. For our species, the moon is a theme of many literary and cultural ideas. And it's more than just waxing lyrical; we also have a long history of attributing human behaviour to moon phases. Calling someone a ‘lunatic’ is a reference to the historic belief that prolonged exposure to moonlight caused insanity and epilepsy. In folklore, a full moon in some instances could also mean turning into a hairy, rampaging beast; lycanthropy is popular in many modern fictions. Morepork: a native nocturnal predator. As it turns out, ecologists are similarly fascinated with the effects of lunar light on behaviour, though for more down-to-earth reasons. Light, including moonlight, is an important regulator of the circadian rhythms of animals. 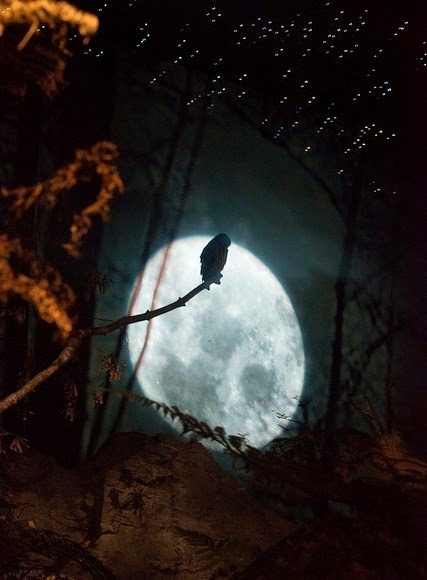 Nocturnal animals are known to alter their foraging behaviour under higher levels of illumination, and such studies have their own moon-related jargon. Animals that avoid moonlit nights are known as ‘lunar phobic’, while animals that are more active on moonlit nights are known as ‘lunar philic’. Typically, small terrestrial mammals that are preyed on by higher-order nocturnal predators exhibit lunar phobia, while the opposite is usually true of their predators. In fact, contrary to Robert Louis Stevenson’s poem, mice and some bats are both lunar phobics. Lunar phobia is thought to be a form of predator avoidance, as more light increases the ability of visual hunters to detect prey. The Ecology Department at Lincoln University have their own literary works on such behaviour. A recent example is a study that was undertaken by University of Göttingen masters student, Jessica Parisi, in 2011. The research sheds new light on the activity levels of brushtailed possums (Trichosurus vulpecula) in New Zealand under full moon and new moon phases. Brushtailed possums are native to Australia, where they are preyed on by snakes, eagles, foxes and dingos. As such, Australian possums display anti-predator behaviour by avoiding well-lit open areas. It was expected that the possums in Jessica's study would therefore be more active during new moons. a dramatic re-creation of the study findings. In fact, Jessica found the opposite: that possum activity was lessened during new moons in forested areas. Possum activity was also still high in open scrub-land even during full moons. Possums are perfectly capable of clambering around tree tops in the dark, so possum foraging strategies must have changed since their introduction into New Zealand. Jessica's results suggest that New Zealand possums don't need to be lunar phobic to avoid predators. Possums don't have many predators in New Zealand, but young possums are sometimes preyed on by feral cats. The feral cat is an ambush predator. It is likely that a preference for high visibility prevents a possum from being attacked out of the black by feline foe. are used to monitor possum density. Brushtailed possums make regular appearances on this blog for one big reason: they are a notorious pest in New Zealand. As opportunistic omnivores, they cause significant tree defoliation and pose a threat to large endemic invertebrates and native chicks. Their widespread distribution also facilitates the spread of bovine tuberculosis. Hence, a great deal of research goes into finding the most effective ways to control possums in New Zealand. Pest management policy mandates that possum density is kept below a certain threshold and, as such, continual monitoring of possum numbers is required to show how effective ongoing control methods are and when further control needs to be undertaken. This research has important implications for the timing of possum control. Poisoning and trapping during times of greatest activity will conceivably increase possum encounter rates with control measures. Control operations may therefore achieve threshold values faster if populations are targeted during peak lunar phases. Similarly, monitoring using indirect measures should achieve greater precision if standardised to particular times of the month. Focusing control on open areas may also be particularly beneficial regardless of moon phase. More than anything, the study highlights the importance of behavioural studies for applied ecology. "Unless we fully understand pest animal behaviour, how can we effectively manage them?" asks James Ross, the supervisor of the study. Spoiler alert: we can’t. Behavioural ecology is essential for informing conservation and pest management, and helps us sort fact from fiction. As such, it is a valuable scientific pursuit. To believe otherwise is lunacy. Parisi, J. D. (2011). The Influence of Lunar Phase on Indirect Indices of Activity for the Common Brushtailed Possum (Trichosurus vulpecula) on Banks Peninsula, New Zealand. (Unpublished master's thesis). Lincoln University, Lincoln, New Zealand. Bartering Biodiversity - Offset or Upset? This blog post was written by postgraduate student Cathy Mountier as part of the course, Research Methods in Ecology (Ecol608). Cathy revisits a Lincoln University research area that looks at the value of biodiversity offsets published in 2008. ﻿I love a win-win approach to problem solving. Wouldn’t it be great to have win-win outcomes where development projects could go ahead, creating economic benefits for local communities, and at the same time protect and enhance natural assets, including native biodiversity? 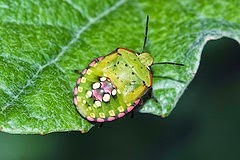 (Native critters and organisms such as plants, birds, fish, insects, and fungi). Biodiversity offsetting is designed to meet these win-win goals. Offsetting trades biodiversity loss caused by development, for a biodiversity gain elsewhere. 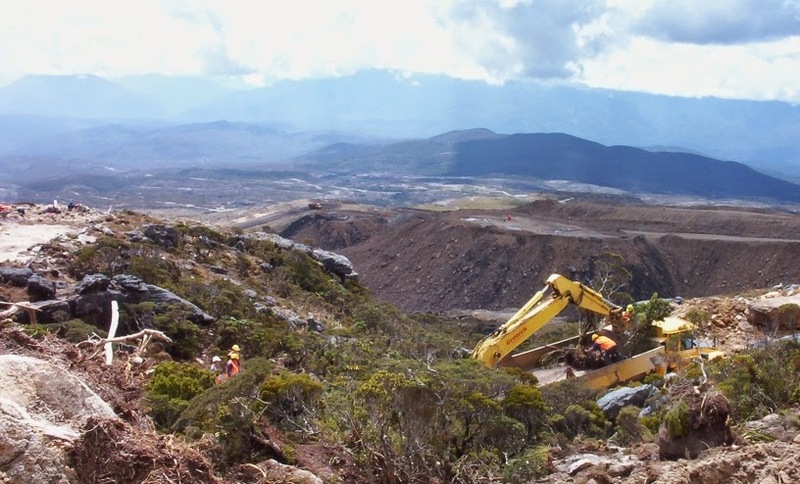 For example the construction of a new road may require diverting a stream into a covered drain, and the offsetting might involve riparian planting and restoration of another stream in exchange. Or if a new subdivision involved bulldozing some native vegetation, this damage might be offset by planting a reserve with native trees. In principle offsetting sounds really good - aiming for no net loss or even a net gain of biodiversity while promoting development. However, researchers looking at the mechanisms and outcomes of biodiversity offsetting concluded that in practice the outcomes for biodiversity are rarely good. So what are the problems? For starters, there is the issue of “currency”. To do a deal, to trade or barter or “offset”, the parties involved need to have some kind of agreed system of valuing the objects of bargaining, in order to come up with a fair deal. It’s an apples and oranges problem. Is one bulldozed hillside of established vegetation equivalent to another newly planted “restored” hillside? 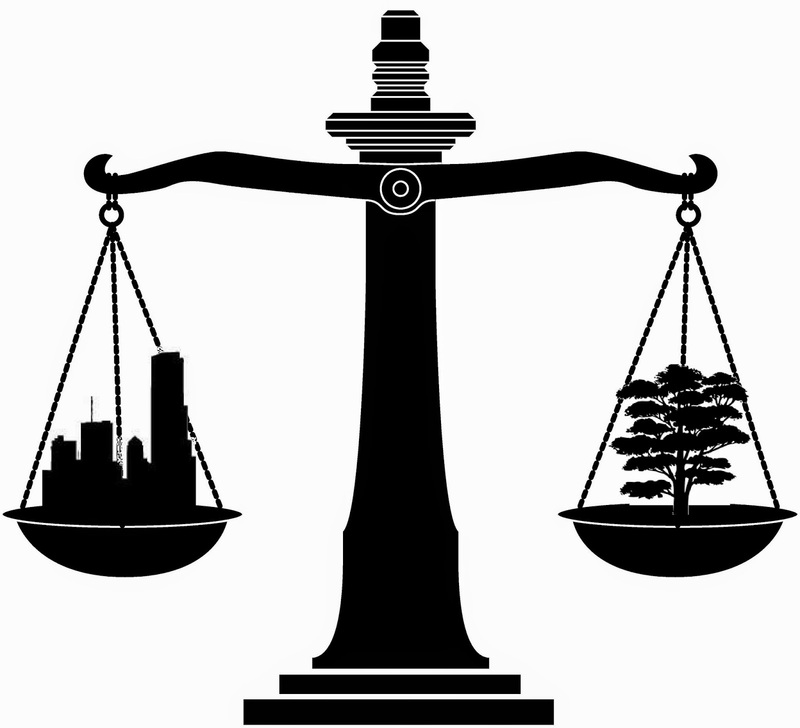 Biodiversity offsetting - a balancing act. Is the goal of no net loss of biodiversity really being met? Biodiversity assets do not lend themselves easily to interchangeability. Enhancing habitat for one species is not necessarily a good exchange for destroying habitat of another species. And species don’t exist alone anyway - ecosystems are complex and interwoven. There have been many suggested improvements to the way “currencies” are calculated and assessed, along with other proposed improvements to the offsetting system. But Susan Walker, Ann Brower, Theo Stephens and William Lee researched biodiversity offsetting and discovered more fundamental reasons why offsetting is very unlikely to succeed in delivering its stated goals. In their paper “Why bartering biodiversity fails” they draw a picture of a triangle of players in the potential offsetting deal, and show that the goals of just one of these groups is likely to dominate the outcomes. First, there are traders - the developers who want to invest in a new project, which requires damaging or destroying some natural habitat. I was surprised to see that restoration/offset providers are also included as traders, but of course they also stand to gain from the business created if an offsetting project goes ahead. Second, then there are the biodiversity protection interests, which are typically members of the public who care, local community groups, such as “friends of ……”, and broader based advocacy groups, such as Forest and Bird. Third, there are regulatory officials. These are the people in government departments and local government offices who are charged with facilitating these negotiations and making sure the agreed outcomes are followed through. This system of three types of players, unfortunately, always tends to tip towards the traders interests. The traders have a vested interest - they stand to gain financially from the proposed development. They have money to invest in the project, and are motivated to spend some resources on getting the project off the ground. ‘Biodiversity protection interests’ people, on the other hand, do not have vested interests. They are often people who recognize the intrinsic values of biodiversity and want to protect the bits that we humans haven’t yet destroyed. They do not stand to gain financially, nor typically do individuals or community groups have a lot of funds to work with. Larger groups, such as Forest and Bird, do have infrastructure and more financial resources, but because they are national organisations it is difficult for them to focus efforts on specific concerns at a case by case, local level. Whereas the developers interest is concentrated on the specific project, environmental protectors interests are often spread wide and thin. Regulatory officials are required, under the RMA (Resource Management Act 1991) to take care of biodiversity in their region on behalf of all of us - the citizens and taxpayers of NZ. This includes ensuring follow-through, as in compliance with agreed conditions and monitoring of outcomes. But because of the nature of bureaucracy, the pressure on these folks to tick boxes and serve the system may at times override or obscure the impulse to serve the greater good. Ann Brower at Lincoln University is one of the authors of the bartering biodiversity paper mentioned above. She has highlighted the triangle of players described here, several times, first and most famously in her book “Who owns the high country?” - an exposé of the tenure review process for South Island high country stations. And then, together with other authors, in a paper about the assessment of significant natural areas under the RMA. In all three of these studies, the dynamics between the three groups of “players” follow a similar pattern - traders, biodiversity protection interests and regulatory officials, and all result in less than satisfactory outcomes for biodiversity. Basically it is a competition between the motivated few and the disorganised many, refereed by the bureaucratically hamstrung, some of whom seem to forget that they are supposed to be looking after the public good and the unique indigenous biodiversity of this country. A study of biodiversity offsetting in Canada, the USA and Australia, by Joe Bull and others, also found that the challenges of ensuring compliance and monitoring, and “conceptual flaws in the approach”, often prevent biodiversity offset schemes from meeting conservation objectives. The concept of offsetting suggests that almost anything is negotiable and unfortunately both the traders and officials have more incentive to facilitate a deal than to ensure biodiversity protection. Hmmm. Offsetting has the potential to “legitimise” biodiversity loss, and allow developers to skip the steps of looking for ways to completely avoid, or minimise damage or loss and go straight to the trading option. Walker, Brower and colleagues conclude that “while compensation and no net loss are worthy goals, and bartering biodiversity might appear more promising than simple and weakly enforced prohibitions…..policies that enable biodiversity trading may perversely yield worse biodiversity outcomes”. Frankly, it is looking a bit grim. Some biodiversity offsetting outcomes are undoubtedly better than others, but Walker, Brower, Stephens and Lee argue that overall, simple prohibitions to protect biodiversity, even if imperfectly enforced, would be more effective than biodiversity offsetting. There is an ongoing discussion about biodiversity offsetting and other forms of ‘compensation for ecological harm’ in New Zealand, and around the world. This Bartering Biodiversity paper has been cited in many other papers (See links to a few at the bottom of this page). The team that wrote "Why Bartering Biodiversity Fails" are a mixed bunch, blending their various fields of expertise, from ecology and conservation to economics and political science. Awesome! They have shown that "tweaking" the offsetting system is unlikely to create the desired outcomes for biodiversity, because of the underlying dynamics between the groups involved. Biodiversity loss may look like an ecological problem, but ecology alone is not enough to deal with the reality of politics, bureaucracy and human behaviour. Collaboration between ecologists, social scientists, and policy makers is the way forward. Biodiversity tradeoffs and offsets in impact assessment and decision making: can we stop the loss? Is there any empirical support for biodiversity offset policy? This blog post was written by postgraduate student Yuan Amata as part of the course, Research Methods in Ecology (Ecol608). Yuan revisits a Lincoln University research area that looks at soil quality from organic farming in 2010. Organic farming is on the rise around the world as it is considered a better alternative to conventional farming. 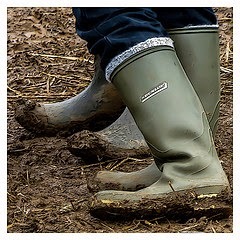 However, problems with organic farming have also been reported. How does organic farming influence the environment? Is it possible for us to make improvements? You may be wondering what the problems are. Before we talk about this, let's first clarify what organic farming is because I've found that many people are confused about the concept. 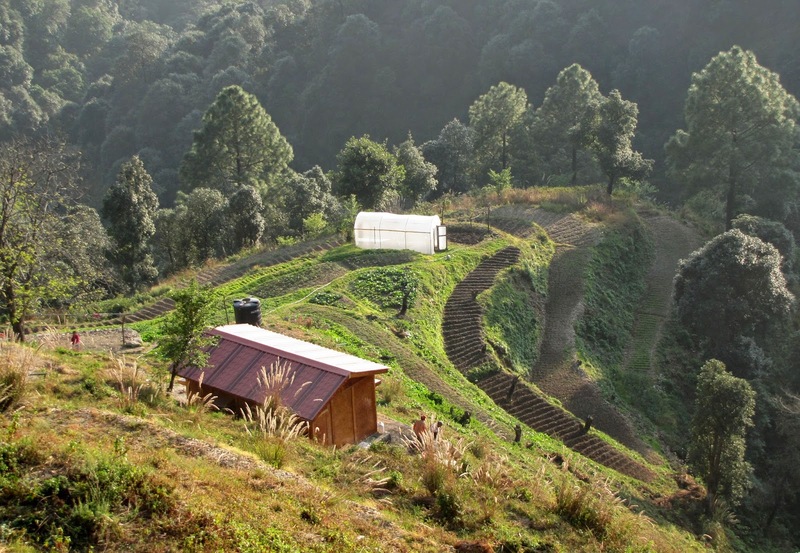 So, what is organic farming? I found this to be a really tricky question. Lots of people have different ideas about organic farming, and what kinds of "organic" should be marketed as organic. As a result, organic standards have been created by many countries and regions. If farms can meet the requirements of the standard, the products can be marketed as organic. Generally, these standard include the regulation of site selection, cultivation methods and crop condition. Synthetic pesticide and fertiliser are not allowed, but some pesticides can still be used under certain conditions. Then, let's look at what we have gained and lost by growing crops organically according to a recent research. Leo Condron and his colleague in Lincoln University studied the environmental effects under organic farming systems in New Zealand. They started by investigating 'soil health' in organic farms. To evaluate 'soil health', some determining factors such as soil quality, nutrition dynamics and balance were tested. Many problems from organic farms were reported in the research. Their were imbalances of phosphorus (P) and sulphur (S), two essential nutrients for plant growth. This is because many native soils are low in P and S in New Zealand and synthetic fertilisers are forbidden in organic farming. Organic fertilisers, however, have relative low nutrient concentrations and, therefore, large amount of organic fertiliser may be needed to meet the nutrient needs of crop plants. In addition, it is also hard to control the degradation of organic materials. Because of these issues, organic farming can lose nutrients from the soil. For example, an organic farm in Canterbury was found with lower "Olsen P" and "phosphate-extractable S" than equivalent local native soil. Even even worse P and S budgets were found to be negative on biodynamic farms. In other words, the nutrients in soil cannot be kept in balance with ongoing cropping. Without intervention, the soil nutrient conditions will get progressively worse. Organic farming is seen as better for the environment because of its lower nutrition losses. However, the authors also challenged the environmental benefits of organic farming. It is true that organic farming generally has a low nutrition loss especially in N and P. However, they pointed out that N losses may only depend on the quantity of N rather than the form. If the nutrition inputs are equal on an organic farm and a conventional farm, their impacts on environment are likely to be same. Organic farming systems normally require more frequent soil cultivation to control pests and weeds. However, this practice can also damage soil aggregates and increase N loss by leaching. There is currently no strict standard to regulate the practice. It is noticeable that certified/modern organic farming does not mean chemical free. Some chemicals are permitted to be used in organic farming system. Although these chemicals are regulated, many of them were still reported to have negative effects on the environment. For example, copper (Cu) compounds used for pest control will affect soil organisms under high concentrations. Rotenone is toxic to fish. Pyrethrum will kill some beneficial organisms. The fine dust of diatomaceous earth is a lung irritant. And so on. All of these could be a hidden danger for human health if the usage is not carefully managed. Despite there are problems, researchers also confirmed that organic farming has some advantages, such as improved soil structure and quality, especially compared to conventional farming. Therefore, organic farming is still, typically, a better alternative to conventional farming. What I am trying to say is that organic farming is not a perfect option. Organic farming could have negative impacts on the environment if it cannot be well managed. However, the question can be raised about whether it is necessary to be organic if we just want cleaner products and less environmental impacts when natural fertilisers and pesticides could also generate environmental and healthy outputs? It is my view that we should focus more on how to produce healthier plant products with minimal impact on the earth rather than dogmatically believing all natural ingredients are best. I think it is better for future agriculture to use organic fertiliser as fundamental inputs combined with integrated pest management (IPM), but chemical fertiliser could also be used to keep the balance among soil nutrition, biological activity and plant growth. 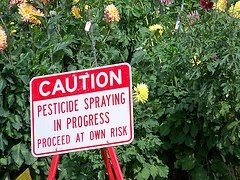 Pesticides should be avoided or only used in some limited conditions. In short, I think further agriculture should more focus on reducing negative environmental impacts. Chemical fertilisers and some pesticides could still be used, but should be treated as "medicine" rather than "food" for plants and soils. I just hope future farming can be better for both the environment and people. Condron, L. M., Cameron, K. C., Di, H. J., Clough, T. J., Forbes, E. A., Mclaren, R. G., & Silva, R. G. (2010). A comparison of soil and environmental quality under organic and conventional farming systems in New Zealand. New Zealand Journal of Agricultural Research, 43(4), 443-466. Our hunter-gatherer ancestors may not have been much more active than we are. Allison Ballance from Radio NZ interviewed Mike Hamlin and I about this idea this evening. You can hear the conversation by here. For more read about it here. As a bonus I talk about the evolution of penguin behaviour as well! For more on this read about it here and here. This blog post was written by postgraduate student Vanessa Mander as part of the course, Research Methods in Ecology (Ecol608). Vanessa revisits a Lincoln University research area that looks at Little Penguin biology published in 2011. I was given your name by a friend as someone who could help me. I was wondering how I could help boost the breeding of the local population of those whitish-blue penguin things. We like them a lot. Ta. Thanks for getting in contact; we are always on the look out for fresh volunteers. I have been reading this great paper recently called “Factors affecting breeding success of the Flea Bay white-flippered penguin(Eudyptula minor albosignata) colony” written by a Lincoln University honours student Warwick Allen, his supervisor Laura Molles and conservationist Francis Helps. I believe it will really help you get to grips with this topic. I suggest you read the whole thing but in the meantime I’ll give you the highlights. Let me indulge by giving you a little background into your whitish-blue penguins. White-flippered penguins are found only on Banks Peninsula and Motunau Island and are a variant of our more commonly known blue penguin. Blue penguins have colonies throughout New Zealand and the southern coast of Australia (where they are known as the fairy penguin). They are the smallest penguin species in the world. The statistics worldwide make for depressing reading. Many blue penguin populations are in decline; for example, in Bank Peninsula there has been losses from 4 monitored colonies over the last 30 years. There are a variety of factors in play, some of which lie squarely on the shoulders of human kind. We encroach on their habitat by building houses, sightseeing and discharging waste, which causes stress amongst existing bird colonies and in some cases, killing them. Other human impacts include overfishing, becoming roadkill and the introduction of mammalian predators (thanks to our forefathers). These predators include ferrets, stoats, cats and rats to name a few and they all predate birds and eggs alike. More on those little critters later. There are some natural events that also have negative effects on local populations. For example, the El Nino-La Nina effect, which can sometimes be responsible for the disruption of fish supplies. Now for a bit of good news. In Warwick's paper, he suggests that a few colonies of white-flippered penguins are now steadily increasing and we are studying these as there is often valuable information about such colonies that will help boost populations elsewhere, possibly even in other penguin species. Francis and Shirleen Helps are active conservationists and they own a slice of paradise in Flea Bay (Pohatu) on Banks Peninsula. Since 1996, they have been monitoring and collecting information about the colony of white-flippered penguins that are breeding there. 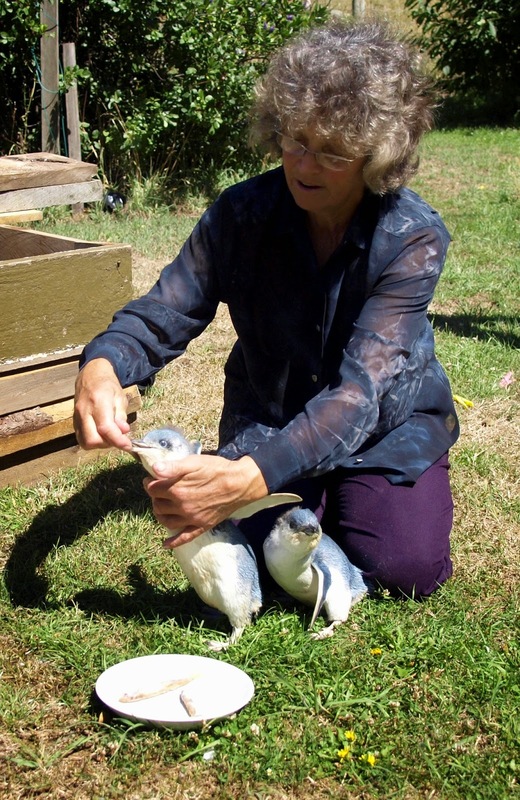 They are a tirelessly dedicated couple who have spent considerable time, money and effort in implementing an active pest management regime and have installed nest boxes around the bay for use by the colony. Warwick (with the help of his supervisor Laura Molles) collated the Help's data gold mine to look at what conditions, both behavioural and environmental, are important to our flippered friends to produce a bumper crop of healthy, happy fledglings. 1. Longer guard lengths: This means that both of the parents took turns to watch over and feed their young and the longer they looked after their young, the better the outcomes for those chicks. If you think about it, this makes sense. A bird can only guard and feed their chick if they, themselves are in good condition. So its a trade off between looking after their chicks and looking after themselves. The better condition the parents are in, then the more care and attention they could give to their progeny. Also this might be an indicator of good foraging - more food for the chicks! 2. Later lay date: If the egg is laid later in the season then it is likely the adults have had extra time to forage and gorge themselves to a point where they are in better condition to look after their young. An additional positive is the idea that warmer temperatures later in the season contributed to better incubation of the eggs and therefore the hatchling has a good start in life. 3. Short pair bond lengths: This is just where the adults have split up and formed new bond a with another mate. This finding is quite interesting because you would assume that if a pair have been together for several seasons that this would lead to a more successful breeding season. But the opposite appear to be true. This might be because they are vying for the best nest-boxes or burrows and that necessitates a different pairing. It would be great if someone looked further into this one to see why this is the case. Other anecdotal evidence also points to having intensive pest management strategies help to protect the colony. Predator traps (for those small mammals that might think penguin chicks and eggs are meals) have almost eliminated predation in the Flea Bay chicks. The authors of the paper also thought the quality of the nest boxes and natural burrows might make a difference too. So now that we know all that, how can we use it to change the fortunes for all penguins? The most important information from this study is that intensive and active pest management regimes decrease chick and adult mortality, which in turn provides more breeding pairs for subsequent years. For these management systems to work they need to be actively monitored. It helps a lot if they can gain robust funding and be implemented by many dedicated volunteers like the Helps family of Flea Bay. I hope this useful and if you wanted to volunteer for a few hours then I can put you in touch with the local coordinator. Let me know how you get on. Me again, that was some awesome stuff you got there. I think I’ve got it covered. I've decided to go into the pet stoat business and they will definitely benefit from all this great research. Excuse me? Can I assume that “pet” is just a typo and you meant “pest” right? So, you're selling pelts? Not quite, I’ve been looking at this place being overrun with these little stoat friends and thought they looked quite cute and cuddly. Surely people would like them as pets, so I might as well share them since there are plenty of them here. If I breed them then there will be plenty more to sell. They are a bit feisty and have a great appetite but they don’t complain. They've really taken a shining to those white-flippered penguins you were talking about. Are you serious? You have a very obvious stoat issue and I’m compelled reply. Although I am not advocating for this information to be used for anything other than sound scientific and conservational research, I do think you ought to discuss your current situation with the Department of Conservation. They will be more than happy to educate you on the legalities of stoat ownership. Stoats are a horrendous problem in New Zealand, with no known predators. They are responsible for the decimation of many kinds of native wildlife including our magnificent white-flippered penguins. I suggest you re-read the first email I wrote to you, slowly, and if you wish to put smiles on the faces of the public then I would recommend you change tact and undertake EXTENSIVE predator control or spend time conserving something worthwhile. I have taken the opportunity to pass your details to the appropriate people and you will be hearing from them in due course. I advise that you click on the following links to start you on your way. P.S. Please refrain from contacting me in future. Note: Any depiction to any person in this blog, living or dead is purely coincidental, with the exception of Francis and Shirleen Helps, Warwick Allen and Laura Molles… all real people. No penguins (or stoats) were harmed in the making of this blog.